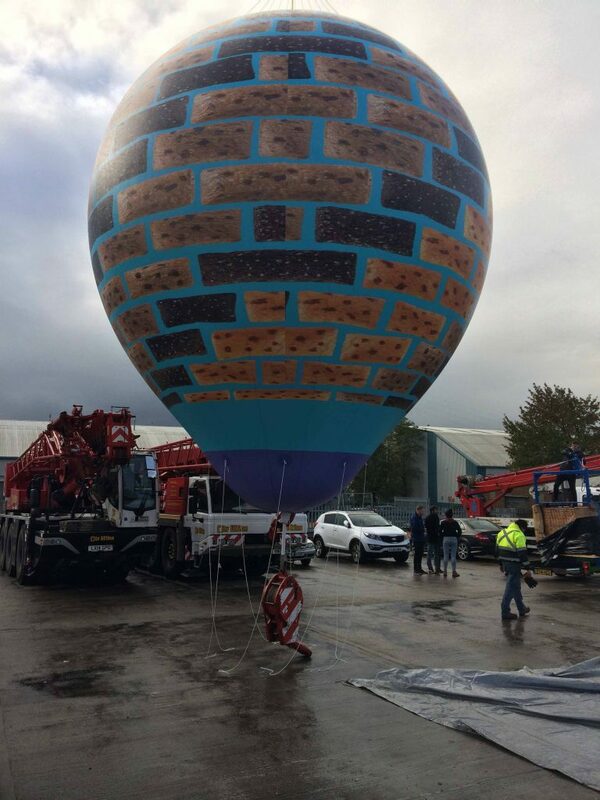 News Cadburys Joy-Filled Hot Air Balloon! 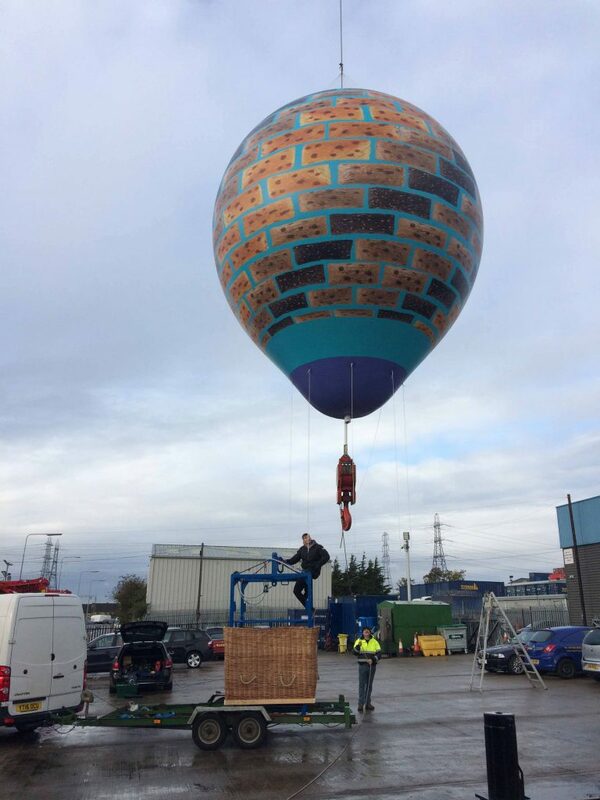 We were asked earlier this month, if we could make an inflatable replica hot air balloon. “Of course,” we said, “that’s easy!” Well, it wasn’t. The project turned out to be a lot more complicated… But in true ABC style we tackled it head on and the result was absolutely brilliant! The brief included the information that a huge crane was going to suspend the hot air balloon high in the air! This meant it couldn’t be inflated by a continuously running mains operated fan blower. So we knew it had to be made as a sealed inflatable. Making a sealed air inflatable is usually quite straight forward as we weld the material together rather than sew it. However, we needed to make it with a hole going all the way through the middle of the balloon. This was so that a cable attached to the crane, with a hook on the end, could pass through it. Tricky! But this was only part of the story. 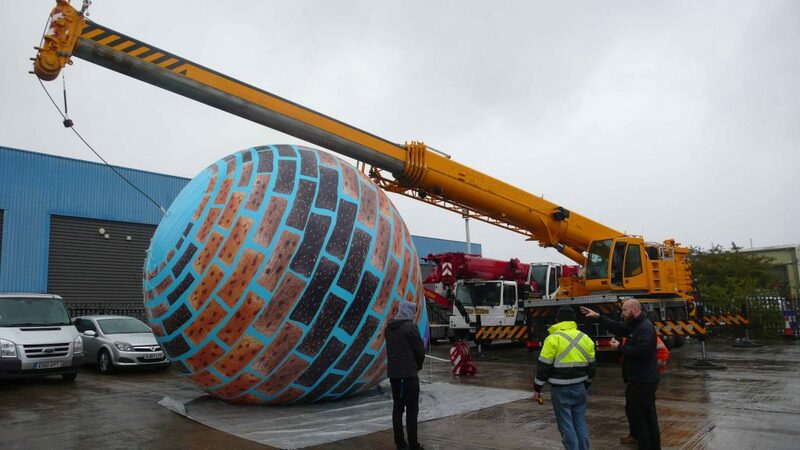 The reason a heavy steel cable had to be able to pass through the balloon, was to attach something heavy. The huge crane was going to lift a steel cage “dressed” as a wicker basket with three people in it. In addition, we had to print the canopy of the balloon all over with a complex design. 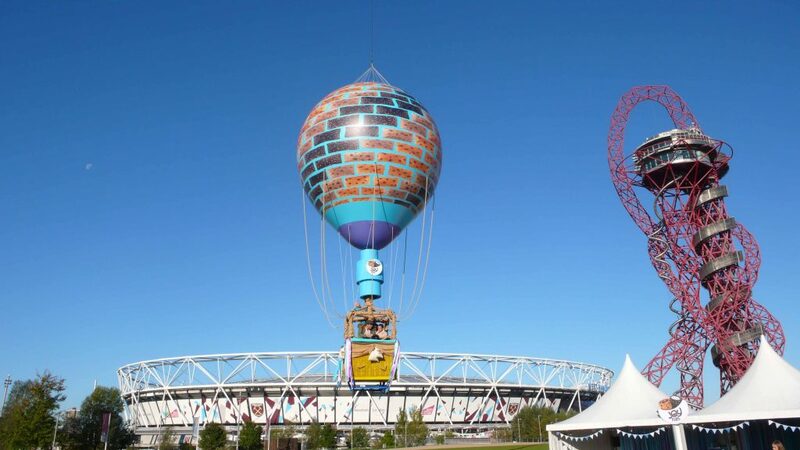 The whole thing needed to look like a traditional hot air balloon in the sky. We were sure we could do this and as you can see from the photos it worked spectacularly well. Doesn’t it look fantastic? The overall effect was amazing. 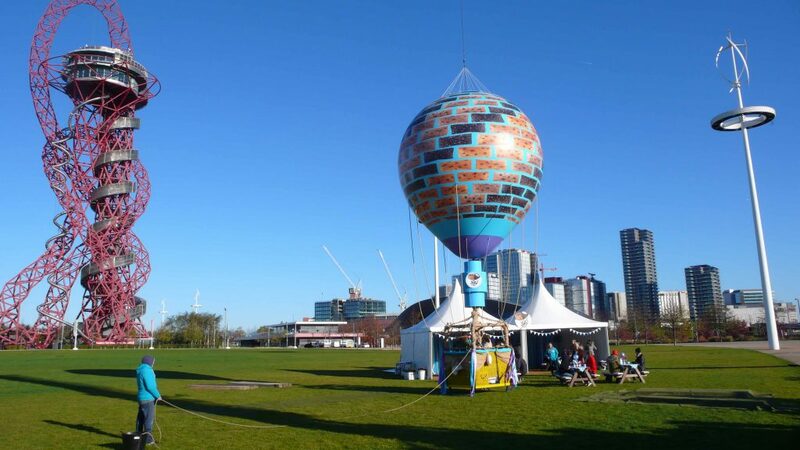 The final piece of ABC Inflatables involvement was to rig the inflatable hot air balloon. We arrived on site at the Queen Elizabeth Olympic Park before dawn. 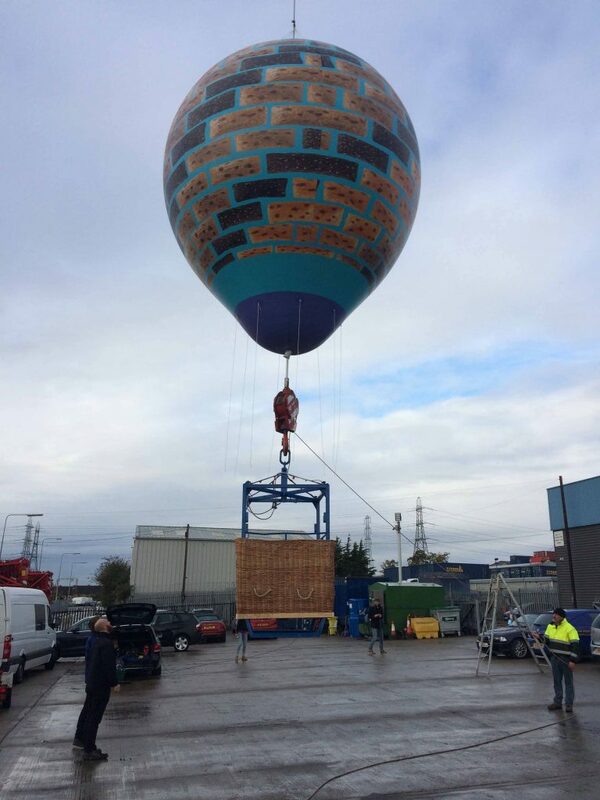 With the expert help of City Lifting, we got the balloon into position. At first light it was ready for the photo shoot. The promotion was to launch Cadbury’s new biscuit called Joy Fills. Two contestants from the reality show ‘Love Island’ were the centre of attention. The weather on the day was glorious and the public’s reaction to the new biscuit was super-positive. However, we think that the real star of the show was our incredible hot air balloon! And everybody loved it! All in all, it really was a joy-filled day. If you have an idea – however complicated – for an inflatable with the WOW factor, give us a ring on 01295 278600. We are experts at creating custom inflatable centrepieces for high-profile promotional events. Just ask Cadburys!